At Lukimbi the 16 spacious suites lead out on raised wooden decks that lead to the main lodge. 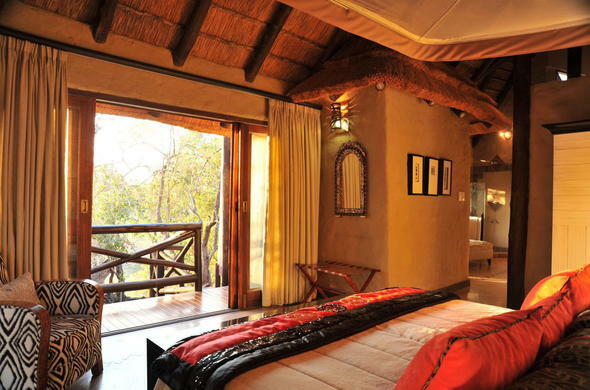 As you walk along the deck you can take in views of the river and the beautiful African decor. The magnificent Giant Eagle owl suite and the King Cheetah Suite have a private pool, dining room and second bathroom. In general, all the suites feature air-conditioning, fans, safes, mini bars, hairdryer, outdoor shower, plunge pool, in-room data port, telephone, and tea and coffee stations. Each suite has a private deck that lead towards the river, providing brilliant wildlife and birdlife viewing. This Family Safari Lodge also accommodates in 2 ultra luxurious suites with their private swimming pools, dining area and 2 bathrooms.